In a recent blog post, Microsoft has announced the general availability of Azure Data Box Disk, an SSD-based solution for offline data transfer to Azure. Microsoft also announced the public preview of Azure Data Box Blob Storage – a feature allowing customers to copy data to Blob Storage on a Data Box. Azure Data Box Disk is advertised as a "hybrid cloud solution" from Microsoft, and allows customers to import their data into Azure using portable solid-state disks. Microsoft provides these solid-state disks in 8 TB (7 TB usable capacity) up to a maximum of five disks – providing a maximum of 35 TB a customer can transfer. 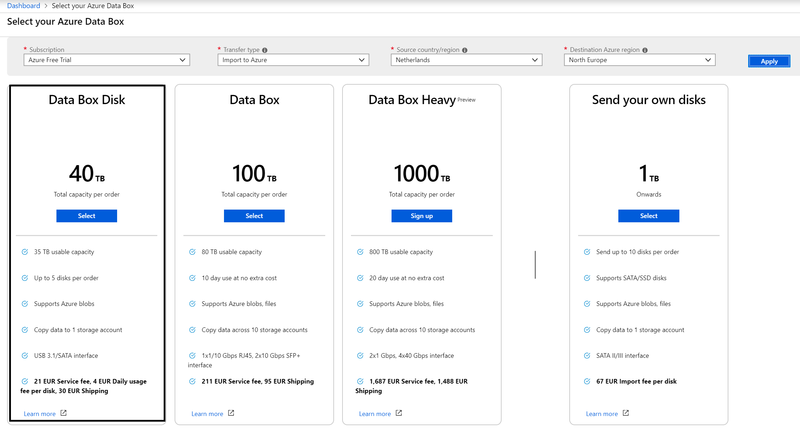 Furthermore, Microsoft also offers two other offline data transfer products called Azure Data Box (up to 80 TB usable capacity) and Azure Data Box Heavy (still in preview and with a usable capacity up to 800 TB). In mid July 2018 the Azure Data Box Disk was released in public preview, allowing customers to load data on encrypted SSD disks via a USB/SATA interface for secure data transfer and provide forward/return shipping to Microsoft data centers in the EU and the United States. Now with the general availability, customers in the US, EU, Canada, and Australia can use this solution from Microsoft. Furthermore, Microsoft announced in the blog post that more country/regions would be added over time. A typical offline data transfer with Azure Data Box Disk can be arranged by ordering a data box disk through the Azure Portal. First, the customer selects the Azure Data Box Disk size. Next, the customer provides an order name, the destination of the data on the disk (subscription, resource group, storage account(s), and data volume in TB’s). Subsequently, the customer provides a shipping address from which the disks will be sent, and enters one or more notification email address(es). Finally, before customers can order, they will see a summary of it. Once customers place the order, Microsoft will, based on the availability, ship the disks within ten days. With the Azure Data Box Disk offering, Microsoft competes with other public cloud providers offering appliances to allow customers to move data from their local servers into the cloud. Google, for instance, provides a Transfer Appliance, allowing a 100 TB configuration with a total usable capacity of 200 TB directly from the GCP console. Furthermore, IBM delivers a Cloud Mass Data Migration service up to a 120 TB of capacity and Amazon Snowball with a capacity up to 80 TB. Lastly, with the Blob Storage on Azure Data Box, Microsoft brings a feature for customers to transfer data from blob storage to a Data box using the blob service REST APIs. With this feature customers can use a blob storage capability from Azure on a transfer appliance. You can transfer up to 100PB using Amazon Snowmobile.